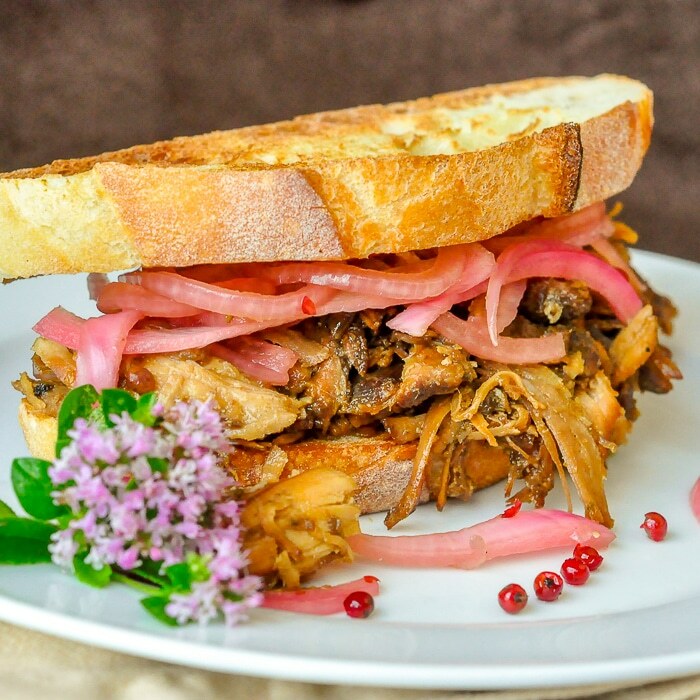 Pulled Chicken Sandwiches with Pink Peppercorn Pickled Red Onions . Pulled Chicken Sandwiches. 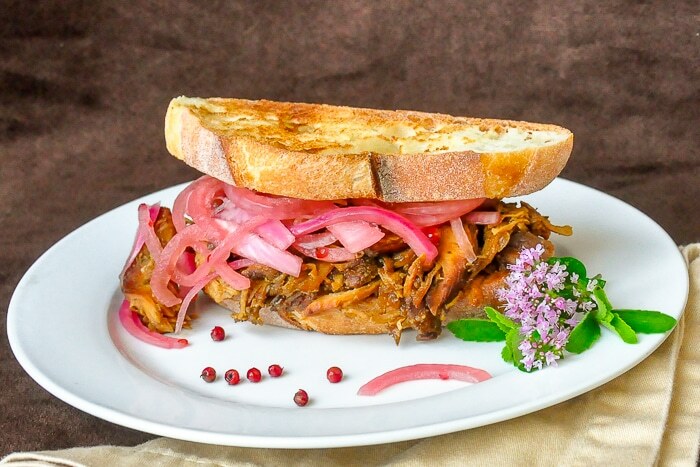 Braised in apples, onions and spices to form its own BBQ sauce, then served with freshly pickled, peppery red onions. A great recipe for game days, casual parties and any time you need to feed the crowd. Spouse brought home a 7 pound stewing hen just because they were on sale last week. She then challenged me to make something edible of it. I’m not a fan of these larger tougher fowls. But I have to say, this tweaking of my pulled pork recipe was a delicious and very economical dinner. We served it over a couple of days to family and friends and they all loved it. Pink Peppercorn Pickled Red Onions. The Pink Peppercorn Pickled Red Onions were delicious on this sandwich too. This is a quick pickling method that is meant to be used within a week or two of preparation. They can be traditionally pickled in sealed and sterilized jars using the manufacturer recommended method to last much longer. It is a great condiment for sausages, hot dogs, hamburgers and even cold baked ham. The pulled chicken sandwiches were made on toasted artisan bread from our neighbourhood Georgestown Bakery. Most won’t have access to that but use any good quality bread you like. Just get the best you can buy or make, wherever you are; this great sandwich deserves great bread. 2019 UPDATE: We are still making these delicious sandwiches on occasion, but now most often make them from chicken thighs or turkey thighs. This makes them particularly economical, as poultry thighs are often on sale and can be frozen until needed. The freezing isn’t a problem when braising is the method of cooking. You may find that smaller chicken thighs will cook to tender faster. Just let “falling off the bone tender” as your guide to when they are fully cooked. 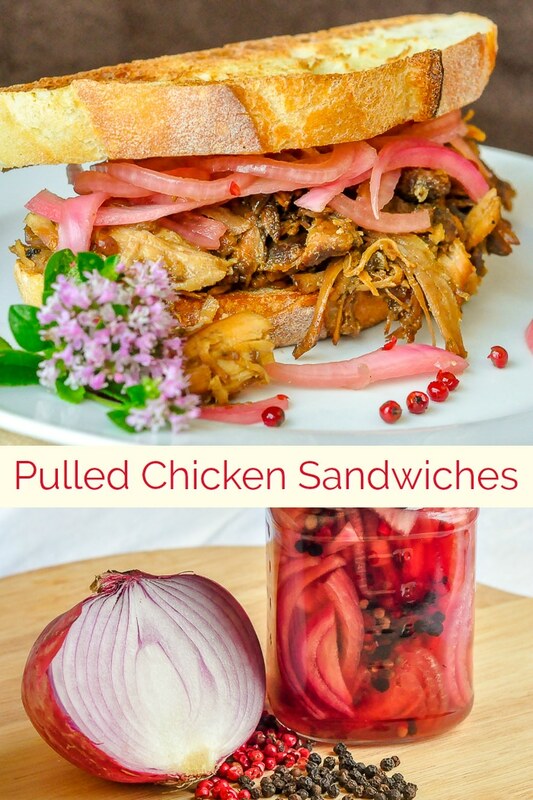 Like this Pulled Chicken Sandwiches recipe? Yield: 12 or more servings. Pulled Chicken Sandwiches. Braised in apples, onions and spices to form its own BBQ sauce, then served with freshly pickled peppery red onions. 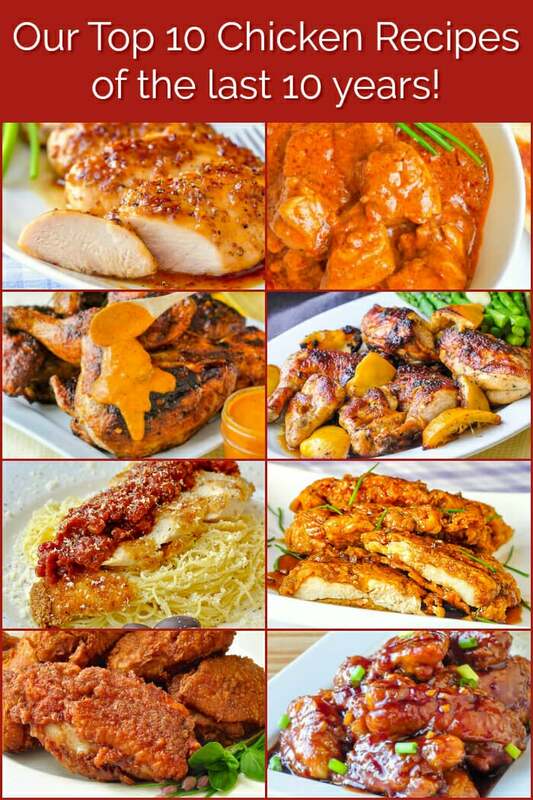 A great recipe for game days, casual parties and any time you need to feed the crowd. 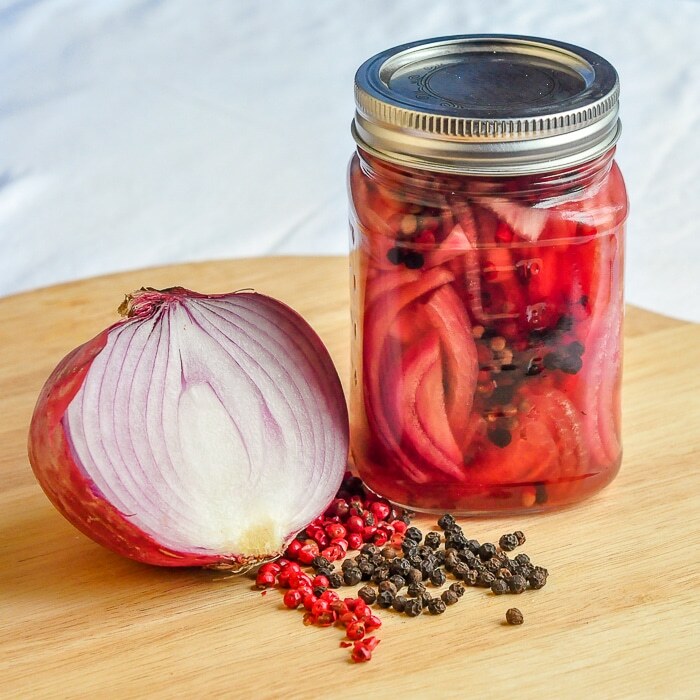 Layer the sliced onions alternately with a sprinkle of pink peppercorns (and black peppercorns) in a jar. Stuff as many onions in the jar as you can. Bring the other ingredients just to just to boiling then pour over the onions and peppercorns. Carefully put the lid on and let sit for at least 24 hours. Remove all the skin from a 6 to 7 pound stewing hen and cut it into 8 pieces; 2 wings, two thighs, two breast halves, and two drumsticks. Combine the ginger, cumin, pepper, thyme, garlic powder, oregano and kosher salt. Brown the chicken pieces in a little oil in a cast iron skillet for just a few minutes on each side. They do not need to be fully cooked in this browning process. Transfer the browned chicken pieces to a covered roasting pan. To the roasting pan, along with the browned chicken pieces, add the onions and apples. Meanwhile mix together in a medium size bowl, the brown sugar, molasses, Worcestershire sauce, mustard, vinegar, hot sauce, salt, pepper, apple juice, ginger, five spice powder and smoked paprika. Pour all over the chicken, apples and onions in the roasting pan. Cover with aluminum foil then the lid of the roasting pan. Roast in a 300 degree oven for several hours ( approximately 3) until the meat is very tender and falling off the bones. Remove the braising liquid to a saucepan, skim all the excess fat and reduce the liquid until it slightly thickens. At this point, puree the sauce with an immersion blender or in a food processor to smooth it out and incorporate the cooked onions and apples. Remove the chicken from the bones and pull it into small pieces. Pour the sauce back over the shredded chicken and toss well to coat the chicken pieces in the sauce. Serve on toasted bread with the picked onions. 2019 UPDATE: We are still making these delicious pulled chicken sandwiches on occasion, but now most often make them from chicken thighs or turkey thighs. This makes them particularly economical, as poultry thighs are often on sale and can be frozen until needed. The freezing isn't a problem when braising is the method of cooking. You may find that smaller chicken thighs will cook to tender faster. Just let "falling off the bone tender" as your guide to when they are fully cooked. Wow, so mouth watering. Never seen sandwich this good and full, really got me salivating. If am to prepare the red onion pickles how long will it take for it to be ready? Do you think this could be done in a crockpot with chicken breast instead? I would think that chicken breasts might be too dry. Could this recipe be done with a whole cut-up bone-in chicken? How would I adjust the cooking time? IIFC The recipe calls for that.